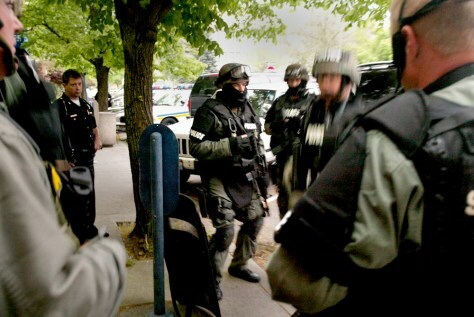 Members of the Idaho State Police perform an equipment check Sunday as they prepare to end a standoff situation at the First Presbyterian Church in Moscow, Idaho. Law enforcement officers stormed the church Sunday where the gunman hid after shooting three people, including an officer, in an ambush late Saturday, police said. The wounded officer later died.